Skydive for $169 through may! The skydive must be paid for in cash. The skydive must be completed Monday-Friday. This offer is not valid with the purchase or use of a gift certificate. Skydive Golden Gate is the closest skydive to San Francisco, and the only skydive with views of San Francisco, the Golden Gate Bridge and Pacific Ocean! Combine these city, bay and ocean views with the most experienced skydive instructors in the Bay Area, an impeccable safety record and a focus on customer service, and you'll find Skydive Golden Gate is the ultimate tandem skydive experience. See below for additional discounts and deals. The only skydive with views of San Francisco and the Golden Gate Bridge! 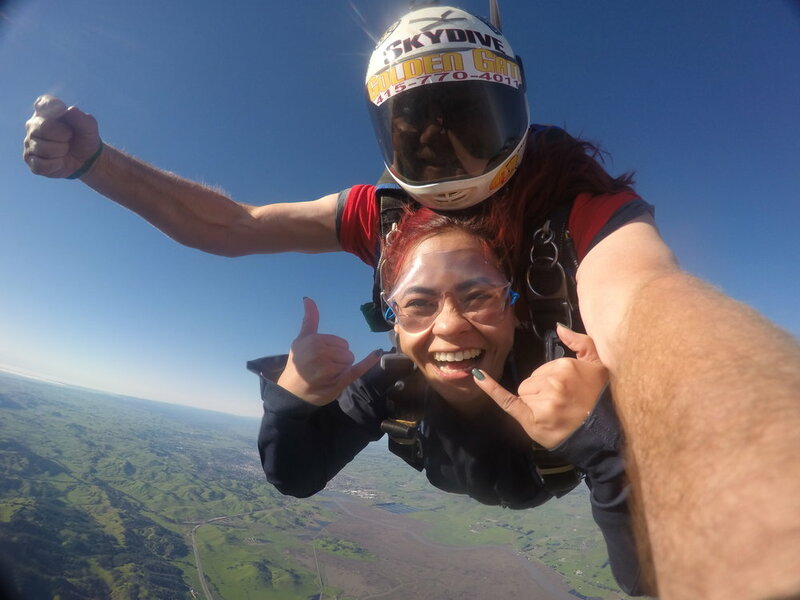 Feel the rush of free falling to earth at 120mph with Skydive Golden Gate's ultimate tandem skydive experience! Once our highly experienced staff deploys the parachute, you'll enjoy breathtaking views of the San Francisco skyline, North Bay wine country, and Golden Gate Bridge as you safely make your way back to the ground. Pictures or it didn't happen! Our tandem instructors have wrist-mounted GoPros, which means they can capture every minute of your free fall AND canopy ride. It also means we don't have to fit an extra camera person in the plane, so we can charge less. Wins all around! Gift certificates available - just call! Groups of more than 10 - AWESOME! - please call for booking options.